Nestled on 5 acres of cedar forest, the Ram's Head Lodge is a friendly and charming lodge located at the base of Red Mountain Resort in Rossland. From the moment your enter the lodge, you will recognize the Ram's Head is a place of extraordinary charm and character. The Inn offers 14 distinctive rooms which include standard rooms, loft suite, kitchen suite and condo. Amenities include free WiFi and outdoor hot tub - a large teak barrel hot tub under the stars. The condo is a self-contained, high-end unit with 2 bedrooms (2 queen and one double bunk bed), 2 bathrooms, indoor hot tub. The kitchen suite has a self-contained kitchen, 2 bedrooms and a living room. It can accommodate 9 people with 2 queen beds, double/twin bunk beds and a queen sofa. The loft suite has two levels and is furnished with 2 queen beds and 3 twin beds. The deluxe unit is spacious with a large bathroom, storing facilities and a king & queen bed. The king room is also spacious with a private deck. And, the standard room has one double bed and one twin bed, and the queen is a cozy room with bathroom and queen bed. Breakfast is served to satisfy the heartiest of appetites. Waking up to the smell of cinnamon buns and fresh baked croissants is wonderful. There's always tasty treats created every morning to accompany: milk, juice, coffee, tea, fresh fruit, cereal, yogurt and toast. Breakfast is included with overnight stays. Enjoy the hearty breakfast, and comfortable and homey accommodation at competitive prices. And, the convenient location. It's a four minute walk to the Red Resort chairlift and amazing biking and hiking trails are steps from the door. Nancy Greene Provincial Park is located 15 minutes from the Ram's Head. It is a roadside park with a natural setting and sub-alpine lake. A great place to visit and have a swim. The Rossland area also offers the Seven Summit Trail - world renowned 30 km / 18 mi incredible mountain biking ride with an International Mountain Biking Assoc. Epic Ride status. 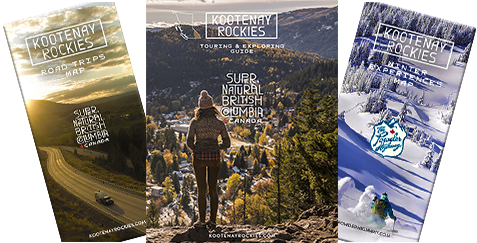 The Rossland area is home to some of North America's top trails. Rossland's Red Resort in the winter.